This object in process is forming a biomimetic representation of the process of osteogenesis (bone formation and growth). 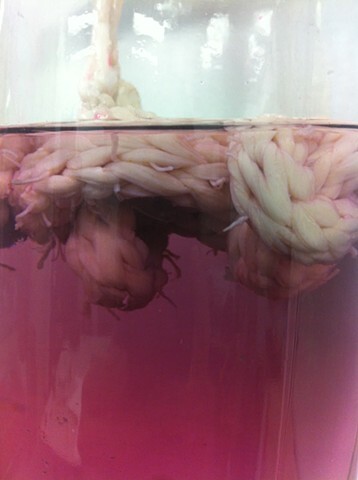 Hog gut is manipulated by corking (tubular knitting) to create a hollow tissue matrix. The matrix form was then suspended in a saturated solution of magnesium sulfate (Epsom salts) to grow crystals. This process, which takes a number of weeks, mimics the half-fantastical and half-real imaginings of the biological process of the growth of hydroxyapatite crystals on a collagen tissue matrix in the development of living bone. This process, which I've named "mock ossification" serves as preliminary research leading to future laboratory-based tissue engineering experiments.